Greetings, food and book lovers, and welcome to another tasty edition of Friday Feast. This week we trip to the tantalising tropics and go a bit nutty with one of Australia’s favourite rural and environmental fiction authors. Plus there’s a giveaway! But first, the disappointment that is Us Heins Weren’t Meant To Play Golf. Sigh. Deep, deep sigh. I was on form, dropping shots off my handicap with almost every round. But that was before, when the sun shone bright and autumn was far away. Now… Oh, it is ugly. So very, very ugly. The summer of my golfing content is over. The curse has returned with the shortening days and I am but a hacker once more. Enough lamenting. It’s time for our guest. Australian author Jennifer Scoullar blazed into our literary landscape with the best-selling rural romance Brumby’s Run, following that success up with Currawong Creek and Billabong Bend. What makes Jennifer’s novels different is their focus on environmental issues. Issues that are often complex and divisive, yet Jennifer handles with knowledge and empathy. From the bestselling author of Billabong Bend, Brumby’s Run and Currawong Creek comes a wonderful new novel set against the spectacular beauty of Queensland’s rocky coral coast. Unlucky-in-love zoologist Zoe King has given up on men. Moving from Sydney to take up an exciting new role in marine science in the small sugar town of Kiawa is a welcome fresh start. Zoe is immediately charmed by the region’s beauty – by its rivers and rainforests, and by its vast cane fields, sweeping from the foothills down to the rocky coral coast. And also by its people – its farmers and fishermen, unhurried and down to earth, proud of their traditions. Her work at the Reef Centre provides all the passion she needs and Zoe finds a friend in Bridget, the centre’s director. The last thing she wants is to fall for her boss’s fiancé, cane king Quinn Cooper, so she refuses to acknowledge the attraction between them – even to herself. But things aren’t quite adding up at the Reef Centre and when animals on the reef begin to sicken and die, Zoe’s personal and professional worlds collide. She faces a terrible choice. Will protecting the reef mean betraying the man she loves? Ooh, this sounds exciting. Nothing like a story featuring a heroine stuck between a rock and a hard place. Definitely one for the buy list. Turtle Reef releases officially on Wednesday, March 25th but you can secure your copy right now. Simply pre-order from those good people at Booktopia, or try Bookworld, Angus & Robertson, Collins Booksellers, iBooks, Amazon.au, Google Play, Kobo, JB Hi-Fi, eBooks.com or your favourite bookstore. All set? Then come swimming in delicious waters with Jennifer. Many thanks for having me on ‘Friday Feast’ Cathryn, and for helping me celebrate the upcoming release of my new book, Turtle Reef. The story is set at the southern tip of the Great Barrier Reef, where rainforests and cane fields sweep down from the foothills to meet the rocky, coral coast. Much more than sugar cane grows in these rich volcanic soils. Shady tropical orchards abound: avocados, custard apples, egg fruit, lychees, mangos – and of course macadamias, the king of nuts. Macadamias aren’t really nuts at all, but the kernels of a hard, green fruit. I’m a bush tucker fan, and sometimes have trouble sourcing ingredients. But these are such popular international favourites, it’s easy to forget they’re indigenous.They grow on lovely rainforest trees that evolved not long after the death of the dinosaurs. For millions of years, they flourished along the east coast of Australia. However by the time Europeans discovered their commercial potential, they only persisted in a small number of rainforest remnants. Today the macadamia tree is our only native commercial food crop. It can bear fruit for over 100 years. The oldest known tree was planted in 1858 at what is now Brisbane’s Botanical Gardens, and is still producing. To celebrate the release of Turtle Reef, here is a simple macadamia recipe with a Queensland feel. I make this cake in a 30 cm cast iron skillet, however any oven-proof fry pan would do. An old-fashioned Aussie recipe, delicious but fattening! Melt ¼ cup butter in pan. Add ⅔ cup brown sugar until melted. Use more butter & brown sugar if needed so that the bottom of the pan is covered with mixture. Once melted, remove from heat. Arrange pineapple rings on top of melted brown sugar. Fill each with a macadamia nut. Chop remaining nuts and sprinkle in spaces, keeping some aside. Sift 1 cup flour with ¾ cup of sugar and baking powder. Add ¼ cup butter and ½ cup milk. Mix until well blended. Add one egg and 2-3 tablespoons of pineapple juice or syrup. Mix well. Pour batter over pineapple, spreading evenly to the edges. Sprinkle with remaining chopped nuts. Bake 40-45 minutes or until golden. Cool on rack for about 15 minutes. Place cake plate over pan, turn upside down and give a little shake. The cake should slide out easily. For an indulgent tropical twist, serve warm, with Streets Blue Ribbon Coconut & Mango Ripple Ice Cream. Yum! Doesn’t that sound divine? I was gone at the mention of caramel and macadamias. And don’t get me started on the sweet pineapple. Thanks for sharing this beautiful recipe, Jennifer. I’ll be testing this one out for sure. Yes, you could win your very own copy of Turtle Reef. Rah! But as always, you must work for it. Not very hard though. We’re about making life easy here on Friday Feast. To be in the draw to win a copy of Turtle Reef, simply share which dish or food reminds you of the tropics. Perhaps it’s a big bowl of juicy prawns with tangy seafood sauce, or a perfect fillet of reef fish with its skin grilled crispy. Maybe mangos or lychees or another exotic fruit like durian makes you think of sandy beaches and warm water. Or even a spicy green papaya salad and aromatic satays on the barbie. Reveal all and you’ll go into the draw. For me it’s Morton Bay bugs. I love those babies and have them every time we head to north Queensland to visit Jim’s family. Served with bowls of nuoc cham for dipping, they go down a treat. A quick trip to the fish co-op and greengrocer, a bottle of something white and zesty to wash them down, and a feast is on. So what brings out the tropics for you? Giveaway closes midnight Tuesday, AEST, 24th March 2015. Australian postal addresses only. If you’d like to learn more about Jennifer and her books, please visit her website. You can also connect via Facebook or Twitter using @JenScoullar. This giveaway has now closed. Congratulations to Amanda B who has scored herself a copy of Turtle Reef. Lots of vicarious tropical living ahead for her. Thanks to everyone who joined in and shared their tropical delights. What fun! This entry was posted in Friday Feast and tagged Australian Authors, Australian bush food, Australian coastal romance, Australian fiction, Australian novels, Australian recipes, Australian romance authors, Australian rural romance, Australian Writers, Australiana, Billabong Bend, book giveaway, Brumby's Run, cakes, Cathryn Hein, Cooking, Currawong Creek, environmental fiction, Food, Friday Feast, giveaways, Jennifer Scoullar, macadamia, nut recipes, pineapple recipes, Recipes, Romance Writing, rural fiction, Rural lit, rural romance, Tropical Upside Down Cake, Turtle Reef, Turtle Reef by Jennifer Scoullar, Upside Down Cake on March 20, 2015 by Cathryn Hein. Is it me, or has 2013 seen some amazing books hit our shelves, especially with Australian fiction? Half way through the year and they’re still coming. July has some beauties, one of them from my Friday Feast guest today. It’s my great pleasure to once again host Jennifer Scoullar, whose debut novel Brumby’s Run was a *ahem* runaway success. As in Brumby’s Run, Jennifer’s love for the natural environment is explored deeply in her new release Currawong Creek. I have this book loaded on my e-reader already and I’m looking forward to diving into its pages. I know that not only will I have a cracking story to entertain me, I’ll also learn about a wonderful new part of the Australian landscape. Double bonus! Heartfelt and passionate rural romance from the bestselling author of Brumby’s Run. When Brisbane lawyer Clare Mitchell finds herself the unlikely guardian of a small troubled boy, her ordered life is turned upside down. In desperation, she takes Jack to stay at Currawong Creek, her grandfather’s horse stud in the foothills of the beautiful Bunya Mountains. Being at Currawong takes some getting used to, but it also feels like coming home. Her grandad adores having them there. Jack falls in love with the animals, his misery banished and Clare finds herself falling hard for the kind, handsome local vet. But trouble is coming, in the form of the Pyramid Mining Company. Trouble that threatens to destroy not only Clare’s newfound happiness, but also the livelihoods of her new neighbours, and the peace and beauty of the land she loves. Tempted? Of course you are! Currawong Creek is available now from from your local book or chain store. You can also purchase online from most excellent 2013 Australian Romance Readers Convention Platinum Sponsor, Booktopia. For ebook lovers, try Kobo, JB Hi-Fi Books, Google Play, Amazon (for Kindle) or iTunes. Thanks so much for having me on Friday Feast again, Cathryn. Your new posts each Friday are a terrible distraction to my writing routine. They always make me feel hungry and I wind up in the kitchen! Continuing the bush food theme of my last visit, I’d like to talk about a wonderful native spinach substitute. Warrigal Greens. (Botanical Name: Tetragonia tetragonoides) It occurs right along the east coast of Australia and is ridiculously easy to grow, either from seed or cuttings. Just imagine, a delicious drought-proof vegetable that’s high in vitamin C. Once you plant it, you’ll always have it in the garden, and it lives without watering or any other care, except for pruning when it escapes its bed. Slugs and snails don’t touch it, and it doesn’t seem to suffer from disease or frost. It’s also a pioneer of bare ground, works well as a ground cover and can be dug in as a green manure. Talk about versatile! You can’t eat it raw though, because of oxalates in the leaves. Blanch the leaves first by immersing them in boiling water for a few minutes and then refresh in cold water. They’re tasty when steamed lightly and chopped with a little butter, or used in salad. It can be substituted for spinach in all dishes, added to casseroles for example, and vegetable slices. Captain Cook was the first European to realise the value of Warrigal Greens. He used it as a protection against scurvy in his crew, even pickling the leaves to preserve them for long sea voyages. His famous botanist Joseph Banks took the plant to England where it became briefly popular as a vegetable. Strangely, I can’t find any reports that Warrigal Greens was used as bush tucker by indigenous communities. I’d love to know whether it was ever used as a traditional food. Maybe one of your readers might hold the answer? 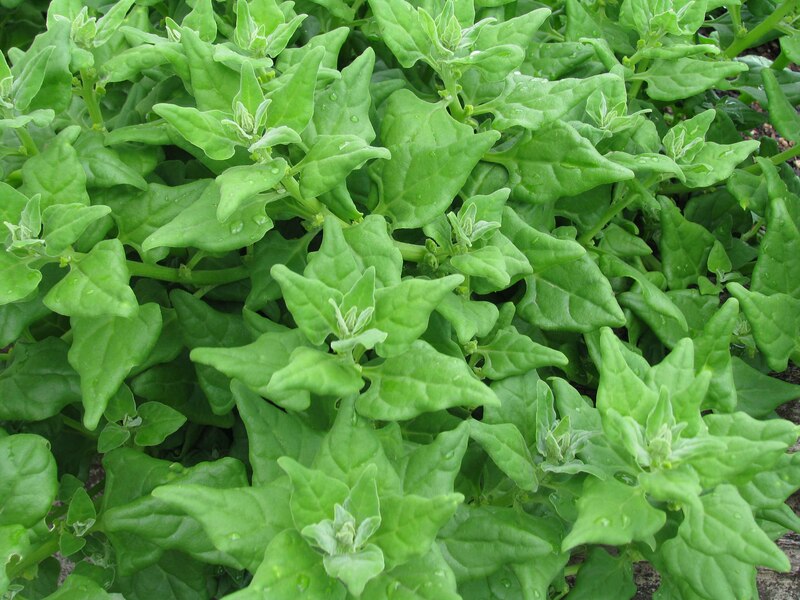 Warrigal Greens seeds are available for purchase from Rangeview Seeds. 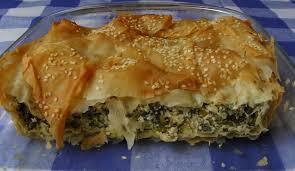 Recipe for a simple Warrigal Greens and Fetta Filo Pie, that only takes ten minutes to prepare. 1. Preheat oven to 180 degrees. Spray a baking dish with the cooking spray. 2. In a medium bowl, stir together everything except the filo. 3. Lay one sheet of filo in the baking dish, allowing the edges to hang over the sides of the dish. Spray with cooking spray. Repeat with 4 more sheets of filo, spraying and alternating the direction of each sheet. 4. Spoon mixture on top of the prepared phyllo in the pan. 5. Spray and layer remaining 5 sheets just the same as you did before. 6. Roll edges of dough to form a rim. 7. Spray the top and sprinkle on a few sesame seeds. 8. Bake for 35-45 minutes or until golden brown. 9. Let stand 5-15 minutes before cutting and serving. Why eat English spinach when you can eat Aussie? Why indeed! And you can bet we taste a whole lot better too. Thanks, Jennifer, for another fascinating post and delicious sounding recipe. I think the futherest I’ve come with using Australian native ingredients in my cooking, besides macadamia nuts, is using lemon myrtle and wattle seeds. It seems such a shame to not use more when we have such wonderful foods to choose from. What about all you clever Feasters? Have you used or eaten any of our native ingredients? Crocodile pie, perhaps with bush tomato chutney? Quondong jelly? Wallaby stew? (the mention of which always makes me think of Spur, from the film The Man From Snowy River, and his infamous wallaby stew). For overseas visitors to the blog, do you have your own favourite native food? This entry was posted in Friday Feast and tagged Australian fiction, Australian romance authors, Australian Romance Readers Convention, Australian Writers, Booktopia, Brumby's Run, Cathryn Hein, Cooking, Currawong Creek, ebooks, Food, Friday Feast, Google Play, iTunes, JB Hi-Fi, Jennifer Scoullar, Kindle, Kobo, promo, Rangeview seeds, Recipes, rural romance, The Man From Snowy River, Warrigal Greens, Warrigal greens and fetta filo pie on July 5, 2013 by cathrynhein.